SUBSIM Radio Room Forums - [REL] SH3 Log Mod; Beta testers required. Without having access to the log during a patrol, it would be rather useless to edit the .clg file. One could think about having access to the log, but in this case one would have to change the script a bit and the log would only be updated after exiting the game, i.e., before exiting the game, the player could see a mixture of his entries (from previous sessions) and the true sinkings of the current session :down: In addition, the player still had to keep a 'true/paper' log outside of SH3 (at least for the current session). It is a bit annoying that you have to use exactly the same name, but there is not much that I can do because it's how SH3 Commander works (Maybe I could make a dropdown menu with the entries from the 'EnglishNames.cfg', but then the app would need to know your SH3 directory path :hmmm:). At the moment the equation is quite simple. If you claim less than what you actually sunk, BdU believes you (--> you get what you reported, i.e., less than what you really achieved). If you over-claim to a certain amount (I don't want to give the true number. 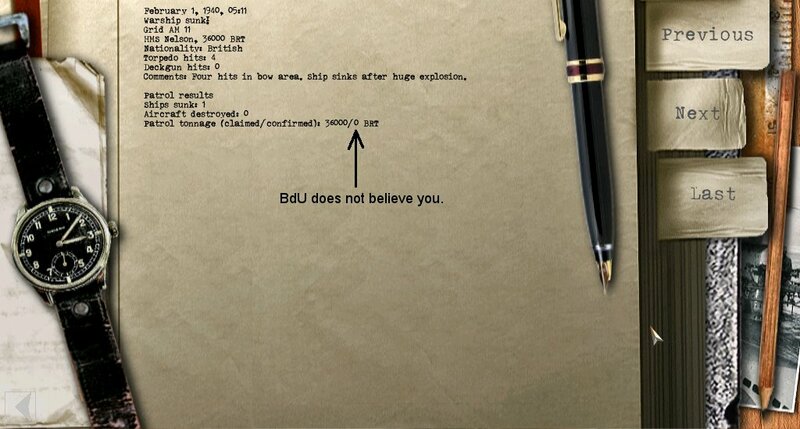 You can find it out yourself), BdU also accepts your results (--> you get more than what you really achieved). If you over-claim even more you get less than what you actually achieved and if you completely exaggerate BdU does not believe you and you get 0 (see the screenshot above. I did not sink anything, but claimed to have sunk HMS Nelson :oops: Actually, I never left the port :rotfl2:).